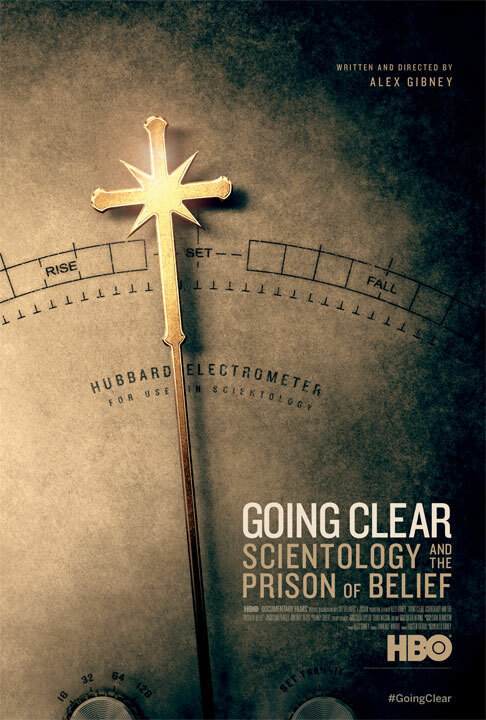 One of the more anticipated smaller films for me this year was Going Clear: Scientology and the Prison of Belief. The documentary, directed by Alex Gibney, is an adaptation of the book of the same name by Lawrence Wright, a professor at the University of Texas. I own the book, but I never got around to finishing it. It’s not like I didn’t enjoy the read, but I’m a horrible reader and I’m bad when it comes to keeping track of all of that. I bought the book primarily due to Wright’s previous work and my fascination with the Church of Scientology. The controversial religion has been a hot button of topic for decades now, as the founder of the religion, L. Ron Hubbard, had escaped being taxed for years and the church was officially deemed a religion by the IRS in the 1990’s. The film covers a lot of the controversial and hot button topics, like Tom Cruise and John Travolta, the church’s most well-known and famous members. But it also goes into detail about the mental and physical abuse from inside the church, with the church leader David Miscavige, the controversial and secretive leader of the mysterious and evil cult. Going Clear may not offer anything new for folks like me who’ve been fascinated with the religion and every aspect of it for years, but this is possibly one of the most important films of not only the year, but of the decade. Gibney tracks down Scientology to the core of the roots, from when L. Ron Hubbard was living with gypsies in Los Angeles to marrying and having children with his wife, whom she claimed threatened to kill her on several occasions and there’s even one instance where Hubbard took their daughter to Cuba to kill her and sell her to a poor Cuban family. We also go into depth on the Sea Organization, which is one of the more controversial aspects of the religion, as well as the e-meter, which auditors from the church “read the thoughts” of the people being audited. It’s quite wild, and hearing all of these personal stories from former members of the church, like director Paul Haggis, actor Jason Beghe, and former spokesman and personnel like Marty Rathburn, Mike Rinder, and more. Now, for anybody who doesn’t know a lick about the Church and how they handle things, some would complain that we never get to see the Church of Scientology’s perspective, and what they have to say about it. Gibney tried to track down people like Miscavige and Cruise and Travolta, but all declined to be interviewed for the film. The ex-members in doc acknowledge that you’re taught to be secretive about every little nook and cranny as to what goes on inside the church, which is why the church always denies any involvement with the camps they have set up for exiled members or anything like that. All of the stories and recounts by the talking head ex-Scientology members are fascinating, and while I knew a good chunk already of what they were explaining in the film due to my obsession with the church, there are still a lot of details in the film that will make your jaw drop, and makes you wonder how and why the Church has gotten away will all of this for so long. Gibney has had a streak of home run documentaries for his entire career, with his most recent being the Steve Jobs documentary that I caught at SXSW a few weeks back, and he has an ambitious 4-hour documentary on Frank Sinatra premiering on HBO next Sunday night. Going Clear is no different from his string of hits, and continues to prove that Gibney is the man you want when doing these expose-type films on either controversial figures, religions, and so on. While there are some details about the Church that I would’ve liked to have seen covered, like the fact that Miscavige’s wife Shelley hasn’t been seen publicly in over 8 years, and that the former spokesperson Tommy Davis has disappeared from the Church completely (and lives in Austin with his wife, supposedly), Going Clear is a film that I hope will be seen by the masses as one of the tipping points in hopefully bringing down this organization. The film premiered last night on HBO and had some pretty decent viewership, as well as a warm reception from audience members. I highly recommend this documentary to people who don’t know a whole lot about this mysterious cult, and for the people who need to open their eyes and see that the wacky church that Tom Cruise and John Travolta are apart of is a pretty evil and despicable place.